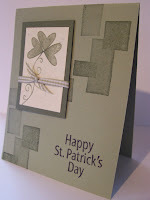 This is a simple St. Patrick's Day card made with a monochromatic color scheme. I used the Sweet Shapes stamp set. I'm finding that this particular set has many more uses than I once thought it did, and I find myself reaching for this set more and more. I love the different tones that you get with the geometric shapes by just stamping the image once.